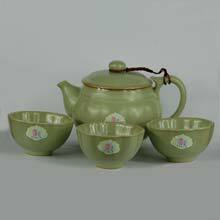 This tea set was created based on Ru Kiln Ware design and style. Ru Kiln operated for about 20 years during the Northen Song Dynasty era, where it produced exquisite wares exclusively for imperial use. As of today, there are only 70 known pieces of genuine Ru Kiln Wares left in the world. There is an ancient Chinese proverb - "It is better to own a broken Ru Kiln Ware than to own ten thousand gold", reflecting on how precious these ancient treasures are worth. Ru Kiln Wares are characterized by beautiful and irregular fish scale-like cracks on their incredibly smooth surface. The patterns of these cracks are unique in each piece. Ru Kiln Wares are said to be able to enhance the taste and smoothen the texture of wine and tea.